The University of North Georgia Athletic Communications department has released the 2018-2019 men’s basketball schedule. Head University of North Georgia men’s basketball coach Chris Faulkner has announced the 2018-19 schedule of contests that includes a nationally televised game on January 9, 2019, against Columbus State in the UNG Convocation Center. The season gets started with three straight home games, beginning with an exhibition matchup against Emory on November 4. The regular season gets going on November 9 as the Nighthawks host the Peach Belt / Conference Carolinas Challenge with matchups against North Greenville and Erskine. Peach Belt play starts on December 1 as UNG travels to Francis Marion before the final non-conference game of the year on the road at Emmanuel. After finals, the Nighthawks will have four out of five at home in league play, including the matchup with Columbus State on ESPN3. North Georgia will finish the regular season with five home games out of the last seven, starting with Spirit Night on February 13 against Young Harris. SALEM, Va. – University of North Georgia sophomore pitchers Amber Johns and Kylee Smith were each named to the NFCA All-America First Team Wednesday night as announced by the association at the NCAA Division II Softball Championship Banquet. Smith was one of three first team pitchers, while Johns was an At-Large selection as a pitcher. Johns, a sophomore from Powder Springs, Georgia, is a perfect 18-0 in 29 appearances this season. She has struck out 112 batters in 110 innings with batters hitting just .146 against her this season. She has the third-best ERA in Division II at 0.76. This is Johns’ first NFCA All-American honor as she was named to the D2CCA Third Team earlier in the day. Smith, a sophomore from Suwanee, Georgia, is 35-1 in 39 games in the circle, compiling three saves as well. She has the most strikeouts in the nation with 320 punch outs to just 43 walks. With batters hitting just .129 against her this season, her ERA is the second best in the nation at 0.65. This is Smith’s second NFCA All-American accolade as she was named to the First Team last year as well. Earlier Wednesday, Smith was named the D2CCA Ron Lenz Pitcher of the Year and to the D2CCA First Team. The pitching duo and the rest of the No. 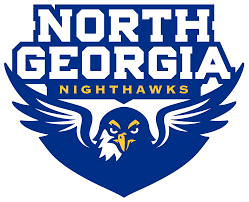 1 Nighthawks will open the tournament tomorrow morning at 11 a.m.
DAHLONEGA – For the first time since 2015, the No. 1 University of North Georgia softball team is headed to the NCAA Division II Softball Championship after coming back to eliminate Young Harris, 2-1, in the Southeast Super Regional Fridayafternoon at Haines & Carolyn Hill Stadium. The Mountain Lions struck first in the fourth, using three singles to scratch the game’s first run across the plate. North Georgia got runners in scoring position in three innings without plating a run prior to finally scoring in the sixth. With a 2-2 count to lead off the sixth, Kaylyn Anthony blasted a solo shot that never got higher than seven feet off the ground, just clearing the fence to tie the game, 1-1. North Georgia took the lead for good as Hobby Gregory came sliding into home on a double steal to give UNG the margin needed to advance in the tournament. Young Harris got a runner to third in the final frame, but a groundout to senior Brittany Gilliam clinched the win, allowing the celebration to begin. – Kylee Smith earned her 35th win of the year, surrendering just one run off five hits and three walks while punching out eight. – The one-run lead for YHC was the first time that North Georgia had trailed in a game since the regular season finale against Flagler when UNG trailed, 1-0, for a half inning before the Nighthawks scored four in the next half inning. – Shelby Hammontree led UNG at the plate, going 1-for-2 with a walk. – With the win, North Georgia officially wins the Battle of Blood Mountain for the fifth straight year, 6.0-4.0. The Nighthawks will head to Salem, Virginia, for the 2018 NCAA Division II Softball Championship and will play on Thursday in the first game. The NCAA Softball Committee will reseed the eight teams prior to releasing the matchups. DAHLONEGA – The No. 1 University of North Georgia softball team will take on rival Young Harris in the NCAA Division II Southeast Super Regional Thursday and Friday at Haines & Carolyn Hill Stadium for a chance to continue the road to a National Championship in Salem, Virginia. The Nighthawks breezed through Southeast Regional 1 last weekend, outscoring opponents by a score of 20-3 on the weekend. North Georgia has hosted four straight Super Regionals headed into the weekend and has never played in a Super Regional away from the Hill. Young Harris needed the “if necessary” game to advance out of Southeast Regional 2 in Hickory, North Carolina, after No. 11 Lenoir-Rhyne came out of the consolation bracket and forced the seventh game. The Mountain Lions are playing in their first Super Regional in program history. The two rivals split their regular season series with YHC taking a 4-3 first game before the Nighthawks stormed back to win, 8-4, in game two. The series will start on Thursday with a 2 p.m. first pitch. Game two will be played at noon on Friday with the third game of the best-of-three series to be played at 2:30 p.m. Friday if both teams split the first two games. Daily general admission is $10 for adults (over 17) and $5 for students (age 8-17), while children under seven are admitted for free. Students of participating schools can pay the student rates by providing a valid student ID. LOUISVILLE, Ky. – University of North Georgia sophomore pitchers Amber Johns and Kylee Smith were named top 10 finalists for the 2018 Schutt Sports/NFCA Division II National Player of the Year award as announced by the NFCA national office Tuesday afternoon. Johns, a sophomore from Powder Springs, Georgia, is a perfect 18-0 in 29 appearances this season. She has struck out 112 batters in 110 innings with batters hitting just .146 against her this season. She has the third-best ERA in Division II at 0.76. Smith, a sophomore from Suwanee, Georgia, is 33-1 in 39 games in the circle, compiling three saves as well. She has the second most strikeouts in the nation with 303 punch outs to just 39 walks. With batters hitting just .128 against her this season, her ERA is the second best in the nation at 0.66. This is the fourth season in a row that UNG has had a student-athlete on the top 10 list and the second consecutive year that two Nighthawks have earned the distinction. The award was created in 2015 to honor the outstanding athletic achievement among softball student-athletes throughout Division II. North Georgia’s Courtney Poole was the inaugural winner of the award. The award winner will be announced on June 4. DAHLONEGA – For the fifth consecutive year, the No. 1 University of North Georgia softball team claimed the Peach Belt Conference Tournament Championship Saturday with a 4-0 win over Columbus State at Haines & Carolyn Hill Stadium. Earlier in the day, the Nighthawks broke the program’s single season wins record with a five inning 8-0 win over Lander in the semifinals. Jordan Deep got things started in the second inning with a solo bomb to left field to put UNG on top, 1-0. In the third, the Nighthawks got rolling again with a RBI double from Brittany Gilliam followed by a RBI single from Alishia Frierson to push North Georgia out to a 3-0 lead. Lexi Duncan kept the rally going in the inning with a double to the wall in right center to plate Frierson before a RBI single by Sydney Sprague to cap off the five-run inning. Sprague walked the game off in the fifth with a two-run bomb to deep center to push the Nighthawks to their 10th PBC Championship game. Both teams were quiet headed into the bottom of the third inning when Sprague struck again for another two-run blast to give UNG a 2-0 lead. After three more quiet innings, Shelby Hammontree hit a two-run bomb that plated Gilliam and gave the Nighthawks the four-run cushion. Kylee Smith (30-1) threw her second one-hitter of the day and struck out nine batters to push the Nighthawks to their fifth consecutive conference tournament championship. – North Georgia has now won 56 games this season, breaking the program record for wins in a single season that was at 54 previously. UNG is 56-2 headed into the NCAA Division II regional round next weekend. – The Nighthawks break the conference record for consecutive tournament championships that Kennesaw State held from 1995-98. – Smith, Hammontree and Sprague were named to the All-Tournament team, while Sprague was named the tournament’s Most Valuable Player. – The Nighthawks are now 8-2 all-time in PBC Tournament championship games and have still never lost in the league’s tournament when holding the top seed. The Nighthawks, No. 1 in the nation and in the latest regional rankings, will likely host the regional round of the NCAA Division II Softball Tournament but will await the selection show to be broadcast Monday morning at 10 a.m. on NCAA.com. DAHLONEGA – Both Sydney Sprague and Brittany Gilliam hit homers on Senior Day as the No. 1 University of North Georgia softball team swept Flagler in the regular season finale, winning by scores of 5-0 and 5-3 Friday night under the lights at Haines & Carolyn Hill Stadium. After Lexi Duncan and Jordan Deep reached base, Sprague blasted her 13th homer of the season over the left center wall with two outs in the second inning to give UNG a 3-0 lead. That would prove to be enough for North Georgia in the game, but the Nighthawks put two more insurance runs on the board. In the fourth, Gilliam doubled to right center, scoring Sprague to put North Georgia up, 4-0, before she was hit by a pitch with the bases loaded in the sixth which brought home the game’s final run. Kylee Smith (28-1) gave up just one hit in her 16th complete game of the year, striking out 12 Saints along the way. Flagler struck first in the nightcap with Jaclyn Mijuskovic blasting a second inning solo shot over the left center wall to give the Saints their first lead of the evening. That was taken away in the bottom of the second. Kaylyn Anthony hit a solo shot with one out in the frame to tie the game before a RBI single by Hobby Gregory that plated two more Nighthawk runs after a throwing error by the Flagler catcher, putting UNG up, 4-1. The Saints struck back in the third on a Maria Kappos RBI double in the top half of the third, but UNG got the run back in the bottom of the frame on Gilliam’s solo blast to right field. Flagler scratched the final run across in the seventh inning on a RBI groundout. – Bria Bush improved to 3-0 on the year after coming out of the bullpen in relief in game two. She threw 5.1 innings and struck out two. – Sprague finished the day going 4-for-6 at the plate after a perfect 3-for-3 first game. Gilliam was 2-for-5 on Senior Day. – The Nighthawks have now won 53 games on the season, making them just one win away from tying the all-time record for wins in a season. North Georgia has won 54 games twice in program history. The Nighthawks will rest until the Peach Belt Conference tournament next weekend at The Hill. UNG, the top-seed in the tournament, will take on eighth-seeded Georgia Southwestern in the first round with game time to be announced later this weekend upon release of the tournament bracket once all seeds are set.